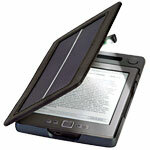 US company Solar Focus recently unveiled a solar cover for the popular e-book reader Kindle. Key feature: The integrated battery which gets charged through the solar panel runs the LED lamp for up to 50 hours using Kindle's main battery. The backpack uses a flexible monocrystalline solar film to convert sunlight into electricity, which is stored in a battery pack kept inside the bag. It can be used to charge portable electronic devices such as mobile phones. The US army developed a solar backpack system called Rucksack Enhanced Portable Power System. The three-kilo backpack was used by the US Army in Afghanistan to power radios and GPS units in combat zones. Key feature: A fully charged battery can power a laptop for three hours or power an emergency light for 14 hours. 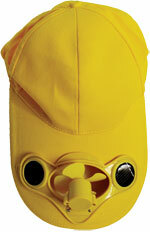 It can be used for disaster relief and field research. 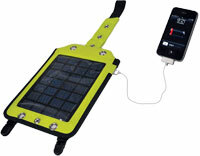 Solar cell phone charger is a portable alternative to standard electric chargers and comes with wrist straps. In 2011, Siberian firm Strawberry Energy released the world's first public solar charger for public places. Manufactured by Indore-based firm Solar India, the thin solar panels on the flap of the cap are used to directly power an integrated mini-fan. Key feature: It works fine even in the rainy season. 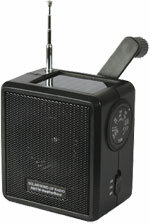 Rothco Solar radio uses a photovoltaic solar panel on top of the radio which gives seven hours of playing time on a single charge. Solar-powered flashlights or torches use light-emitting diode lamps, which consume less energy than the popular incandescent light bulbs. A typical solar flashlight can illuminate objects up to 50 metres away. The solar cells used for charging the battery have a long life expectancy. These flashlights are popular in places with erratic power supply. Key feature: Some models have inbuilt cell phone chargers, radio or an emergency siren. Some of them can also be used as lamps. 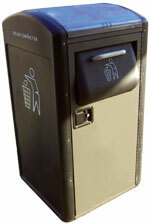 US firm BigBelly develops solar-powered, rubbish compacting bins to be used in public spaces such as parks. It has a capacity of 567 litres, and exerts 5.3 kilo Newton of force to compress the articles in the bin. 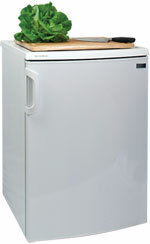 This increases its capacity by five times. The compaction mechanism runs on a 12 volt battery, which is charged by solar panels. Key feature: It uses wireless technology to intimate the waste management department when it needs to be cleaned. The solar-powered refrigerator uses a high efficiency, variable speed, direct current vapour compression cooling system without a battery. Electronic controls directly connect the refrigerator's solar panel to its compressor. Would be great if the article listed prices of the featured products and availability in India.